Unique, funny, creative, and clever WiFi names have become the order of the day since the accessibility to the nearest wireless internet connection is very essential to our living. In recent times, there has been so much dependence on not just any type of internet connection, but reliable and fast internet. Because of this, almost everybody who can afford to get a wireless internet router in which they can be able to connect all their devices (smartphone, television, laptop, PC, etc), and possibly those of their family members, have gotten and installed one in their homes. Shop owners have even gone ahead to install wireless routers in their shops in order to attract more customers. Free internet has proven to be a huge attraction to people, so that at least while they wait for their turn to get a haircut or their weave done, or patronize whatever service it is that you may be offering, they could be able to access the internet to send out that tweet, meme, and picture that would get them trending and more followers or give their opinion on a social issue they carry close to their heart. 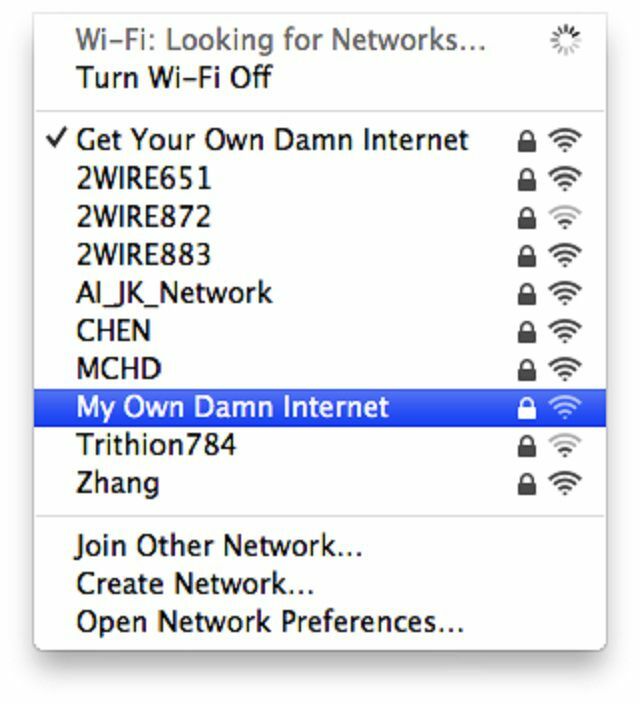 People tend to use their WiFi names as a way of expressing their creativity, sense of humor, beliefs, hatred, and in some cases, as an opportunity to send a subliminal message to a neighbor since one way or another, everybody tends to check out the list of available connections even if they too might have one for themselves. Below is a list of the funniest and creative WiFi names, as well as those that might be somewhat creepy. We have opted to group them into different categories and also explain some of them for those that might be slow to understand their meanings. Feel free to take one of them if you are finding it hard to come up with a suitable name for yourself. Note: Depending on your provider and setup restrictions, special characters like punctuation marks or other symbols (!, ?, @, %, &) and the dollar or other monetary signs ($, £, €) may not be allowed in your wifi name. Regardless, there is still more than enough WiFi names to go around. – Wi-Fi, do you love me? – Scooby-Doo, Where Are You? 1. Launch your favorite internet browser (Chrome, Mozilla, Explorer, etc) and type http://www.routerlogin.net into the address bar. 3. When the BASIC Home page displays, select wireless and enter your new username in the Name/SSID field. Also, enter your new password in the Password/Network Key fields. 4. Click the Apply button to save changes and complete the process.